Courses at local Further Education colleges and work experience with businesses and other organisations in the community form an essential part of the KS4 curriculum. As a result, students make more progress and are more prepared for employment, training and independent lives. The school budget is simply insufficient to cover all the costs. Fortunately a number of supporters from the charitable sector have generously stepped into the breach; most recently, as the result of a successful bid by the school, St. James’s Place Foundation has donated £2,500 towards the cost of one day per week work experience placements and one day per week college placements for Year 10 and 11 students. 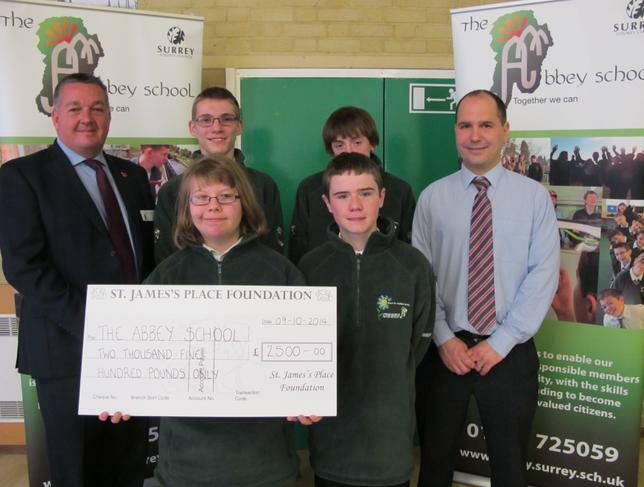 Peter Earle, representing the St. James’s Place community, visited The Abbey on the 10th of November to present the cheque at a special school assembly. “This generous donation from St. James’s Place Foundation will make a huge difference to our students by helping to secure the on-going provision of work-related learning opportunities for them in the local community. These placements are vital in enhancing learning opportunities for the students and in preparing them for the next stage of their educational (and working) lives”.